Special chemicals for specific needs. Some Lesser Known Spa and Hot Tub Chemical Products. Scroll down to browse through some archived SPA and Hot Tub questions and answers. Please click the Spa Topics Link, on top of every page, to access a complete listing of Spa and Hot Tub Problem subjects, an alphabetized Website Table of Contents, Spa and Hot Tub Equipment Information, About Alan Biographic Material and a Spa and Hot Tub Glossary. Use the other links to access additional subject information. More information about some new and unique products, for Spas and Hot Tubs, can be found by visiting The Website Store. You'll never know what you'll find and that's always fun. Be better prepared and avoid costly problems! Many spa water problems require a different chemical approach. The water used to fill or top off a spa can contain dissolved metals and unwanted contaminants. Usually, after chlorine and pH control chemicals are added, discoloration and staining can follow, if the water contains iron, copper or manganese. Testing the water, before it is added, will alert you to the presence of a potential problem. 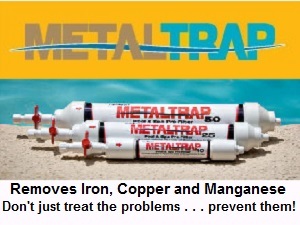 A MetalTrap Filter or MetalTrap Dual-Cartridge Filter can help you remove any dissolved metals and sediments, avoiding staining and discoloration problems. 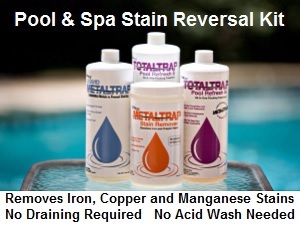 If the underwater surfaces have stains, a MetalTrap Stain Reversal Kit contains everything to dissolve the stains, eliminate the stain-causing metals from the water and help prevent a recurrence. 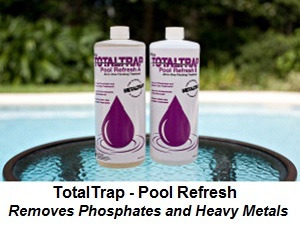 TotalTrap - Pool Refresh can be used to remove dissolved heavy metals and phosphates, by vacuuming to waste or filtration. A ColorQ, all digital Water Tester can perform all of the common tests, while eliminating the color-matching and guesswork. With 10 models, performing up to 11 different test factors, one is right for every need. Get 21st Century water clarity, when you use a Nano-Stick Clarifier. Simply hang it in the water. 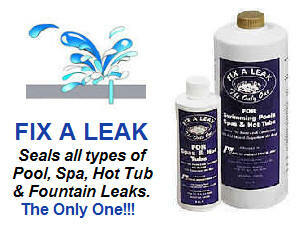 A spa leak can be a troublesome thing Fix A Leak has been sealing all types of spa leaks, for over 35 years. Easy to use and surprisingly effective. As the spa and hot tub industry has matured, specialty chemical products have evolved. There are specific products - for specific problems! Various products make maintenance easier or more effective and choosing the right product for the task can help assure a better prospect of success, as well as saving time and money. If problems arise, refer to the Spa Problems Page, as a source of problem-solving information, broken down into various categories. Scroll down the page and click on the linked keywords, catch phrases or images, in the archived answers below, to access additional information, on that topic or product. Alan, I was wondering if you could share some info on a spa sanitizer, that is an enzyme powered sanitizer. It sounds too good to be true. Is there a catch with this product? Thanks. Enzymes are not sanitizers. All sanitizers must have an EPA registration number. Look for it. This product might help reduce chl orine requirements, but it is neither a sanitizer or oxidizer. I like to be able to measure a sanitizer level. 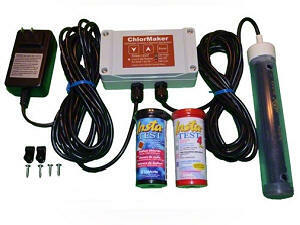 Free chlorine is the active sanitizing form of chlorine and the recommended level is 1-3 PPM. Very much higher levels can be irritating. 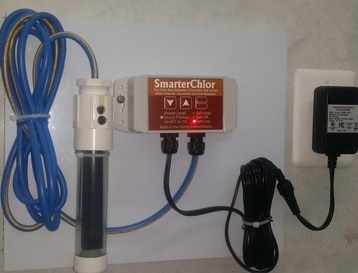 As a backup to chlorine and to allow good results, while maintain a lower chlorine level, you might consider adding an EPA registered spa sanitizer and disinfectant and will help you maintain a suitable free chlorine level and maintain proper sanitation. A salt chlorine generator can do that, while avoiding many of the issues, associated with traditional chlorine products. To further improve the water quality, an Ozone Generator will make a big improvement and reduce chemical usage. It will provide oxidation and reduce chlorine usage, even more. I hope that this information will prove helpful. ► Cyanuric Acid In A Spa? Glad to hear the you are happy with the ColorQ Digital Water Analyzer. You do not need to have any cyanuric acid present. A zero reading is expected, in a freshly filled spa or one that has not been using dichlor. If you are using bromine, none is being contributed by the chemicals and none is required. I hope that this has resolved the matter. Enjoy the hot water experience and thank you for the purchase of the ColorQ. ► Enzymes In A Spa? Can enzyme products be used to help deal with oily accumulations around the water line? Thanks. The removal of oily residues is one of the main uses of Enzyme products. Enzymes help to digest or decompose these organic deposits and help to prevent them from forming "soaps." The formation of these "soaps" will add to the foam problem. Regular additions are a good maintenance practice. Enjoy the spa. My spa water gets cloudy on occasion. It doesn't seem to be the water chemistry or the bromine level, as all tests seem to be within balance. Is this a filtering problem? Thank you for allowing the questions to be asked. It certainly could be a filter problem, but it is difficult to say for sure. It could be bather waste products, debris and byproducts. Adding an enzyme treatment can help decompose the waste products and help improve the water clarity. The regular, periodic addition of a spa formula clarifier can help improve the filter efficiency and help eliminate the spa water clarity problem. Even better would be a Nano-Stick Spa Clarifier. This 10-inch stick is hung in the water and it uses a new 21st Century technology to clarify water. It can last up to six months, while not contributing any chemicals, but helping to eliminate fine debris and improve clarify. I hope that the information helps to clear things up. ► Benefits Of Enzyme Use? My local spa dealer has been touting the benefits of using enzymes in spas. Exactly, what do they do? It is worth doing? Enzymes can do many beneficial things for your spa. Enzymes can help digest or biodegrade oily residues, bather wastes, cosmetic residues and organic byproducts. In turn, this can improve the appearance of the waterline area and the water clarity. And there 's more. The oily residues can harbor bacteria and impede sanitation, cause an increase in foaming and require more frequent water replacement. Enzymes can help remove organic deposits from the filter cartridge and lead to better filter efficiency. If fact, the more the spa is actually used, the more likely it is that an enzyme will be of significant benefit. Enzymes work very well in spas and hot tubs because the warm water helps to speed up the degradation process. The end products of the process are harmless inerts and there are no residues to buildup. Yes, it is worth using! However, if it is being touted as a spa sanitizer, that is another matter. Sanitizers must be registered, with the EPA, and enzymes are not registered. While it can help improve spa water quality, sanitizing should be left to products such as salt chlorine generators, chlorine and bromine. I hope that I have been helpful. Enjoy the spa experience. Can I use auto wax on my spa? I have no idea what is in an auto wax and, whether or not, it is suitable for use on a spa. I suggest that you use a product especially formulated for use in a spa. Check with the spa manufacturer, as to care recommendations. Good luck. I see products that are used to add a fragrance to the spa. Are they safe? Can I use cosmetic bath products? Thank you. The spa fragrance items that are specifically formulated for use in the spa environment are safe to use. These products are not similar, in terms of their ingredients, to bath products. Spa water is not changed after each use. Bath water is. Do not use any cosmetic bath products in your spa. To do so might result in cloudy water, loss of sanitizer and oily residues. I hope that I have been helpful.